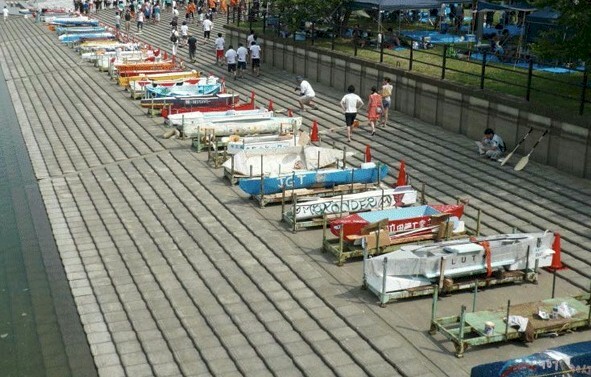 Concrete canoe racing began in Japan in 1995. Nowadays, several competitions are held throughout the country (Japanese venues). Japanese concrete canoes are typically limited in length to 4.0 meters. The race course is typically 300m in length. In 2013, Miyagi Ishinomaki Technical High School's "Ishikou 9" was selected as the best product among 46 entries. The Japanese Nationals are sponsored by the Japan Society of Civil Engineers. A comprehensive history of the events held in Japan can be found by visiting Concrete Canoe Japan (CCJ). Entries typically line the shore during the opening ceremonies. Photo by JSCE. Our sources tell us that the Kanto Branch of the Japan Society of Civil Engineers (JSCE) will sponsor the next All Japan Challenge. Chances are that the competition will be held on the left bank riverbed of the Arakawa detention pond "Saimizuumi" in Toda City, Saitama Prefecture. A large number of entries are expected from universities, technical colleges, and high schools throughout the country. Ishinomaki team members celebrate victory! Teams from Miyagi Ishinomaki Technical High School placed first and second at the 2015 All Japan Challenge. A team from YuMakoto-daka finished thrid. The competition was sponsored by the Kanto Branch of the Japan Society of Civil Engineers (JSCE). It was held on the left bank riverbed of the Arakawa detention pond "Saimizuumi" in Toda City, Saitama Prefecture. A large number of entries participated from universities, technical colleges, and high schools throughout the country. The awards ceremony (left) followed the races (right). Photos by JSCE. Miyagi Ishinomaki Technical High School successfully defended their national title at the 2014 Centennial Cup. Forty-one entries were fielded from universities, technical colleges, and high schools throughout the country. The competition was sponsored by the Kanto Branch of the Japan Society of Civil Engineers (JSCE). won the competition with "Ishikou 9" (below; photo courtesy of CCJ). The 2013 competition was held in the Arakawa detention pond Saimizuumi Toda City, Saitama Prefecture. Forty-six teams competed in the event representing universities, technical colleges, and high schools throughout the country. Although the weather conditions were not ideal, a new course record was set in the 300m race. Competition reports can be found here and here. The Japan Society of Civil Engineers (JSCE) was established as an incorporated association in 1914 entrusted with the mission to contribute to the advancement of scientific culture by promoting the filed of civil engineering and the expansion of civil engineering activities. Since its establishment, JSCE has endeavored to achieve the above mission, through extensive activities including scientific exchange among members and researchers, promotion of science and technologies relating to the filed of civil engineering, social involvement, etc. Over the years, the JSCE membership has increased significantly from the initial 443 members to approximately 39,000 members at present, and is currently engaged in various wide-ranged activities around the world.